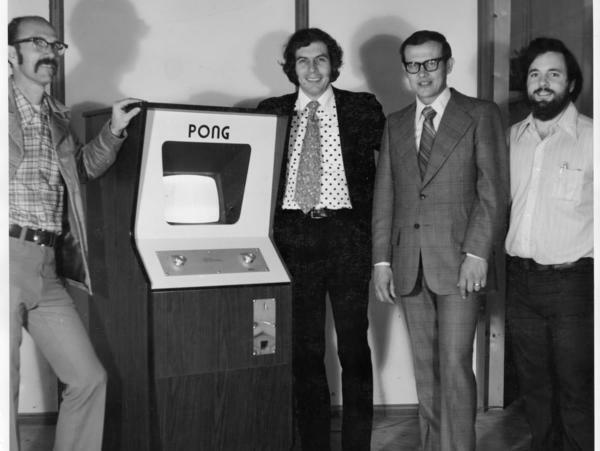 Ted Dabney (far left) stands in front of a Pong arcade machine in 1973 with (left to right) co-founder Nolan Bushnell, head of finance Fred Marincic and the man credited with the idea for Pong, Allan Alcorn. 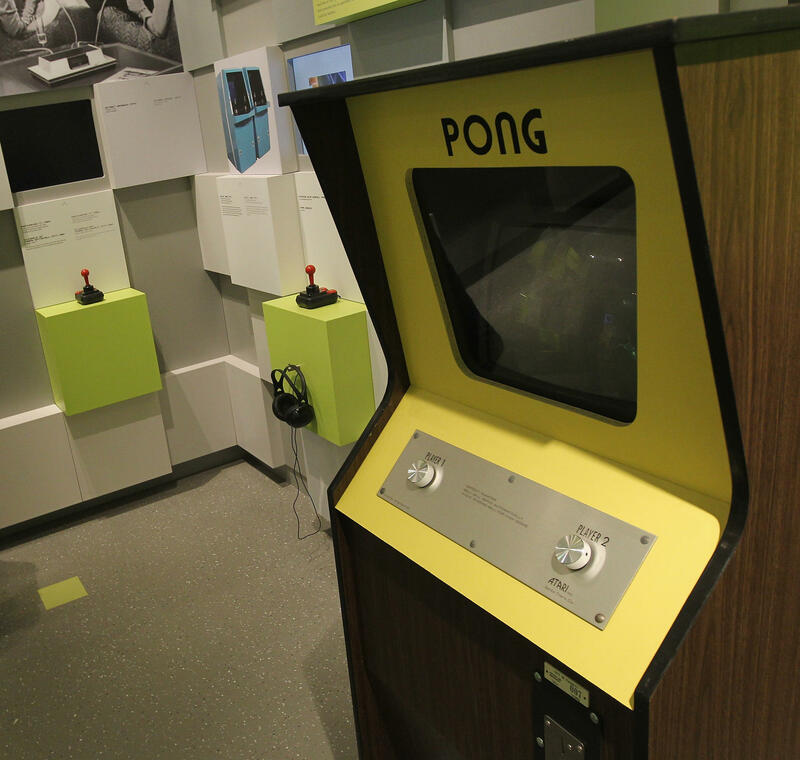 An early console of Pong stands at the Computer Game Museum in Berlin in 2011. As Samuel Dabney told it, the whole thing began with pizza parlors. Dabney, who generally went by Ted, and Nolan Bushnell had been working together at an electronics company called Ampex back in the mid-1960s, and Bushnell had an idea for a "carnival-type pizza parlor," Dabney recalled in 2012. "It's one of these things, you have these ideas and no way you could ever make it happen," he told the Computer History Museum. "I mean, you could barely afford the pizza, much less buy a pizza place." Turns out he was right — they couldn't afford to start a pizza place, at least not then. But those conversations did start a tumultuous partnership that would, within just a few years, go on to create Atari, introduce Pong as a cultural phenomenon and help blaze a trail for the very medium of video games as we know them today. Last weekend, nearly a half-century after those opening conversations, Dabney died of cancer at the age of 81. The electrical engineer, U.S. Marine and Atari co-founder led a life about as eventful as his packed CV suggests — but things did really seem to accelerate when those thoughts of pizza entered the picture. That's mainly because the duo had a few other thoughts, too. Bushnell and Dabney left Ampex toward the start of the '70s, with the intent to work out a pet project of theirs. The idea was to create a game that eschewed the mainframe computers of the era for television sets. Without the bulky, inaccessible hardware of the computer, these games could be coin-operated, stood up in repurposed cabinets, and so conveniently devised that they could even be played in — you guessed it — pizza parlors. Dabney invented the early technology that allowed dots to move on a screen without the assistance of an extremely expensive computer, and thereby essentially invented modern video games. It was called the Spot Motion Circuit, and it allowed a dot to move up, down, left and right on a screen. It was a different world from the supercomputers that [games like] Spacewar was running on, as it allowed dedicated cabinets to be manufactured at a reasonable cost with built-in boards. It was essentially the invention of the video game arcade cabinet. First named Syzygy, the company they co-founded came to be known as Atari. The first game the men made together after striking out on their own was called Computer Space. It had modest success — enough, at least, for them to develop another game program one of their earliest employees, Allan Alcorn, had been noodling with. It consisted of a couple of white lines, a little white spot between them and a simple premise: just try to hit it past your opponent's "paddle." They decided to call it Pong. They set up the first console in Andy Capp's Tavern in Sunnyvale, Calif. — and to their dismay, it wasn't long before the coin-op machine broke down. "Oh my God," Dabney recalled in 2012, laughing and saying Alcorn had to head down to the tavern right away to sort out the situation. When he arrived, their dismay quickly turned to disbelief. "The coin box got so full of coins, it jammed the coin mechanism. ... So that was incredible." Pong was so popular, it got too much money too fast to keep functioning. Orders began to flood in, employees joined by the droves, and deadlines multiplied. They found they had to break down the barriers hemming in their once-little company — literally, in one memorable case. As cabinets piled up and space in their makeshift headquarters dwindled, Dabney said he "got a sabre saw out and cut a hole through the wall" into the home standing empty next door. The landlord came by and told them they couldn't do that, Dabney said, adding that Bushnell replied: "We did it. You just have to tell us how much we owe you." Eventually, though, as with that first console in Andy Capp's, their partnership failed beneath the weight of that vast, fast influx of money. By the end of 1973, Dabney left the company they had founded together, saying that as Bushnell took over more and more of the company's operations and direction, "that was the end of our relationship." Bushnell bought him out, and that was that — or so they thought at the time. Dabney continued programming in a variety of engineering jobs in the decades to come, and even ran a grocery store with his wife in California in the '90s. But like many neatly wrought narratives, the story of Dabney and Bushnell's partnership eventually found its way back to the start: in other words, pizza parlors. Just a few years after their falling out, Bushnell ended up buying that pizza place he'd been thinking about, a restaurant geared toward slices and kids' entertainment called Pizza Time Theatre. And he came back to Dabney asking for some help. Though Dabney's initial assessment was blunt — "it was crappy, it was dirty, it was noisy, the pizza wasn't very good" — he couldn't help lending a hand anyway, designing a system to notify people when their meals were ready. By the way, that company — after quite a tumultuous life of its own — eventually came to be better known as Chuck E. Cheese's. "Ted was my partner, co-founder, fellow dreamer and friend," Bushnell tweeted Saturday after Dabney's death. "I'll always cherish the time we spent together."